The following are the latest results contributed by HM Courts Service, for cases sentenced by West Sussex Magistrates’ Court sitting at Worthing from October 30 to November 1, 2017. Louise Ryan, 22, of Portland Road, Worthing, was given a 12-week prison sentence, suspended for 12 months, with Thinking Skills programme requirement and rehabilitation activity requirement, and must pay £50 compensation, £115 victim surcharge, £300 costs, after admitting assault by beating in Worthing on May 13, 2017. She must pay £200 compensation after admitting causing £200 damage to a television and bank card in Worthing on May 13, 2017, no separate penalty. She also admitted breaching a conditional discharge order and was dealt with for the original offence, receiving a two-week concurrent prison sentence, suspended for 12 months, for resisting a police constable in Littlehampton Road, Worthing, on October 25, 2016. Philip Foster, 46, c/o Elmwood Avenue, Bognor Regis, was given a ten-week prison sentence, suspended for 24 months, with rehabilitation activity requirement after admitting carrying a kitchen knife in Barnham without good reason on April 24, 2017; and two charges of using threatening words or behaviour causing harassment or distress, racially aggravated, in Barnham on April 24, 2017. He must pay £115 victim surcharge, £200 costs. 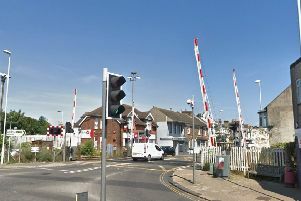 Reece Stroud, 30, of Clun Road, Wick, was given a community order with 90-day curfew, electronically monitored, from 7pm to 4.30am, with rehabilitation activity requirement, after admitting sending a grossly offensive message in Littlehampton on June 12, 2017; and two charges of assault by beating in Littlehampton on May 25, 2017. He was also given a restraining order and must pay £85 victim surcharge, £400 costs. James Archer, 27, of Gloucester Place, Littlehampton, was fined £252 and must pay £30 victim surcharge, £85 costs, after admitting drink-driving (73mg of alcohol in 100ml of breath) in Chapel Road and Liverpool Road, Worthing, on October 15, 2017. He was disqualified from driving for 18 months. Christopher Best, 27, of Crosshaven, Littlehampton, was fined £1,032 and must pay £103 victim surcharge, £85 costs, after admitting drink-driving (93mg of alcohol in 100ml of breath) in Brighton Road, Lancing, on October 13, 2017. He was disqualified from driving for 24 months. Adam Owen, 34, of Granville Road, Littlehampton, was given a community order with rehabilitation activity requirement and must pay £50 compensation, £85 victim surcharge, £85 costs, after admitting stealing a box of wine worth £16 from Tesco, Littlehampton, on October 13, 2017; and assault in Littlehampton, on October 13, 2017. He also admitted breaching a community order and was dealt with for the original offence, receiving a community order for two charges of criminal damage in Rustington on November 6, 2016. Daniel Paun, 29, of Grange Road, Ilford, was discharged conditionally for 18 months and must pay £20 victim surcharge, £85 costs, after admitting stealing clothes worth £308.82 from TK Maxx, Worthing, on October 12, 2017. Neil Woods, 44, of Shakespeare Road, Worthing, was given a community order with rehabilitation activity requirement and must pay £85 victim surcharge, £85 costs, after admitting stealing alcohol and food worth £137.84 from Sainsbury’s, Rustington, on October 12, 2017; and resisting a police constable at Chichester Custody Centre on October 13, 2017. Yasmine Sanane, 20, of Penlands Vale, Steyning, was fined £185 and must pay £30 victim surcharge, £85 costs, after admitting drink-driving (70mg of alcohol in 100ml of breath) on the A27 Lancing on October 15, 2017. She was disqualified from driving for 18 months. Nicholas Warby, 37, of Barns Farm Lane, Storrington, was fined £161 and must pay £30 victim surcharge, £85 costs, after admitting drink-driving (42mg of alcohol in 100ml of breath) on the A27 Shoreham flyover on October 16, 2017. He was disqualified from driving for 12 months. He was fined £242 after admitting carrying a Stanley knife without good reason on the A27 Shoreham flyover on October 16, 2017. Daniel Rawlins, 43, of Winterberry Way, Wick, was discharged conditionally for 12 months and must pay £150 compensation, £20 victim surcharge, £85 costs, after admitting taking a truck without consent in Worthing on May 11, 2017. He must pay £100 compensation after admitting stealing fishing equipment worth £429 from a man in Littlehampton on May 11, 2017, no separate penalty. Reiss Scott, 18, of Joyce Close, Wick, was fined £340 and must pay £34 victim surcharge, £85 costs, after admitting driving while disqualified in Wilcox Way, Littlehampton, on June 6, 2017. His driving record was endorsed with six points. Paul Weller, 52, c/o Helyers Green, Wick, was fined £55 and must pay £30 victim surcharge, £100 costs, after being found guilty of breaching a criminal behaviour order by drinking a can of lager in public in Clun Road, Littlehampton, on April 6, 2017. Darren Ensor, 51, of Chestnut Walk, Worthing, was fined £301 and must pay £30 victim surcharge, £100 costs, after admitting driving without due care and attention in Chestnut Walk, Worthing, on February 18, 2017. His driving record was endorsed with four points.